Wool Diaper Covers breathe the best!!!! Wool is naturally antibacterial. I have found wool to be so easy to care for - as you don't need to wash as often. Just let it air out and smells are gone. If poop gets on it, soak in a bucket with some wool wash for 20 minutes, squeeze out and hang dry. When I use wool covers, my baby never soaks through and has no problem with rashes. Organic merino wool is perhaps the softest, most luxurious organic wool in the world. 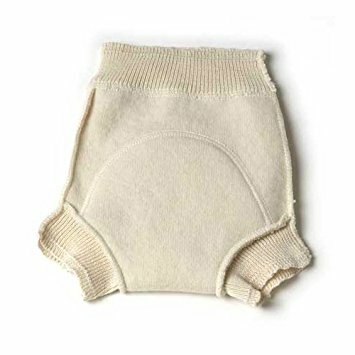 This is the trimmest fitting and least bulky of the organic wool pull-ons, thus is the best choice in this style for daytime use. It is also excellent for nighttime. The size medium and large have an adjustable elasticized waist. You have to feel this cover to believe it. The picture does not do justice to this cover. Designed in Demark, produced in Lithuania. This cover is terrific because it is trim and soft. It works wonderfully over thick and thirsty diapers. Formerly called LANA, now called LANACare.